Lorna Humphreys had dreamed of doing a skydive but she never believed it would be possible. Thanks to a new drug which improved some of her MS symptoms, she was able to live out her dream. Here she tells us all about the big day. I have secondary progressive MS and at the beginning of last year, doing a skydive was an impossible dream. Then I started taking a drug called fampridine and my arms and legs improved so much I wondered if I had a window of opportunity. So I applied to do a skydive. It was not going to be straightforward. Would they accept me, as I still had mobility disabilities? I was put in touch with the chief instructor at my chosen airfield who explained the positions I would need to be able to adopt and hold for several seconds. If I could not do it during the training session on the day then I would not be allowed to go ahead with the jump. 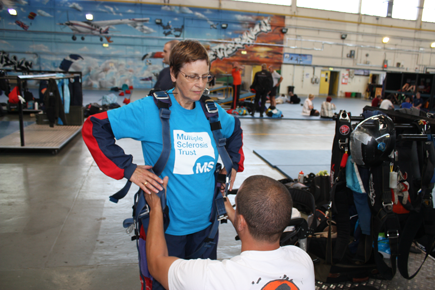 I practised at home and found I could do it, so I applied through the MS Trust and booked my skydive. The forecast was not great for the start of the day, but it would be improving from midday onwards, so my husband and I set off with hope. We arrived soon after 10am and I registered and went through the training session. That went well. Now I just had to wait with all the others for the cloud base to lift so we could get a flight slot. It was a long wait! Fortunately, there was a sofa in the canteen where I was able to lie down and have a sleep for a while. Eventually my name was called and I went to meet my instructor/partner to be kitted up. I felt really well cared for as they made allowances for my limited mobility. I left my rollator at the gathering point, and was driven to the plane. We took off at around 4pm. The plane climbed for about 20 minutes until we reached 13,500 feet and the views were stunning. Then it was time to jump and we were the first to go. We were free falling! Wow! The only problem came when I tried a big toothy grin. I felt as if I had bitten into an ice lolly straight from the freezer. Ouch! From then on I smiled with my mouth shut! After about 45 seconds, there was a sharp jolt as the parachute was deployed. Then all changed as we started a gentle descent back to our start point. For five or six minutes I was able to enjoy the wonderful views before we were safely back on the ground. I sat and waited as they called the transport to take me back to where I had left my rollator. 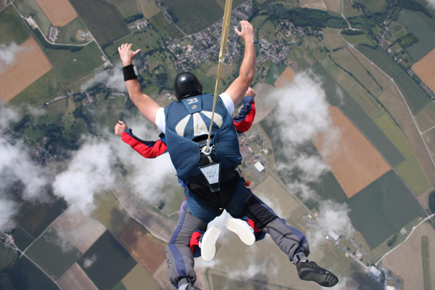 I had been concerned that my balance might be upset and make the descent uncomfortable but, although I avoid choppy seas and fairground rides, I had no ill effects during the skydive descent at all. I was elated, but absolutely shattered. My adventure was over all too soon. I was glad I had decided to pay for the video and photos. It was an amazing experience thanks to two brilliant, skilled and caring guys Stu (instructor/partner) and Trev (photographer).